More to the point, there is a fine line between playing a game and just sitting in a chair hitting the same button over and over and over. The game Everquest wobbles and weaves back and forth across that line like a sloshed sorority sister trying to get to the bathroom. You can make up your own vomit jokes. 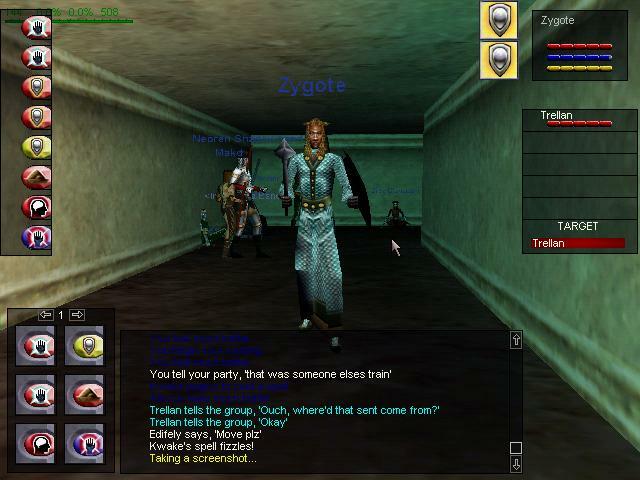 One moment Everquest is an adventure into dangerous dungeons to retrieve powerful magic items. Then the next moment after four hours of sitting in the same spot you realize the only interaction you�ve had with the game is hitting the same four buttons over and over. So I guess we�ve had enough of that nonsense? How bout we just cancel? Well now, let�s not be so hasty. I mean, we�ve been camping this Frenzied Ghoul for five plus hours, I�m certain the Haste Sash will drop on the next spawn. So settle in, you only need 4 hours sleep anyway. The pattern of denials and rationalizations from an Everquest player is similar to that of a drug user. In fact Everquest is disparagingly referred to as �Evercrack�. The lure and addiction of the game is so insidious that most players� knew they were suckers for playing. Entire groups would bemoan the fact that they had wasted an entire day camping a spawn for an item that dropped once in the last 9 hours and was then ninja looted by some a-hole named �Clubber�. Yet we continued to pony up the Jacksons for the privledge of being used and abused. So it went with me anyway. I had pretty much figured out the simplistic yet addictive nature of Everquest by the time I was level 5. Yet I continued to play knowing full well I was just a rat punching a button to get his pellet. Perhaps even more damning is the fact that once I quit Everquest it was on to another MMOG that offered essentially the same gameplay. Although in my defense, I�ve yet to play another MMOG for as long as I played EQ, which was approximately 2.5 years. I ended the last EQ journal whining about my awful experience as a dark elf abroad in Faydwer. Despite that, I would spend another twenty levels on my dark elf before coming to my senses and switching over to a less maligned race. However, before I would do that I would enjoy or perhaps a better turn of phrase would be subjected to, the growing pains of a massively exploding phenomenon.